When the first autofocus systems hit the market, they changed not just cameras and lenses, but the entire world of photography. Canon stood at the forefront of this revolution, pioneering a design philosophy where the camera determined where to focus, while the lenses held the motors to perform the focusing. This allowed for the use of motors best suited for a particular lens, keeping weight at a minimum and reliability at a maximum – a method virtually all SLRs use today. Non-stop research with this same eye on the future is why professionals worldwide rely on Canon cameras. Canon continues to strive to further evolve and enhance our AF technology for both optical viewfinder and Live View AF systems. These, combined with carefully integrated features honed from decades of development, allow photographers of all skill levels to capture beautiful images of that one, critical moment. With Canon’s high-precision optical viewfinder AF system, high-quality bright prism and Intelligent Viewfinder, you can see exactly what the lens sees alongside instant information like camera settings, without any chance for glare. 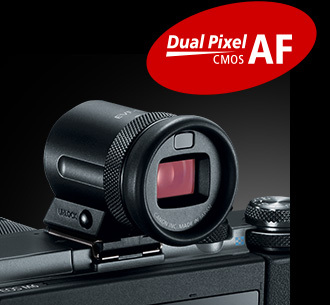 Dual Pixel CMOS AF, a highly advanced Canon technology made possible thanks to state-of-the-art CMOS image sensors, works with DIGIC Image Processors to help ensure incredibly fast focusing when using Live View. 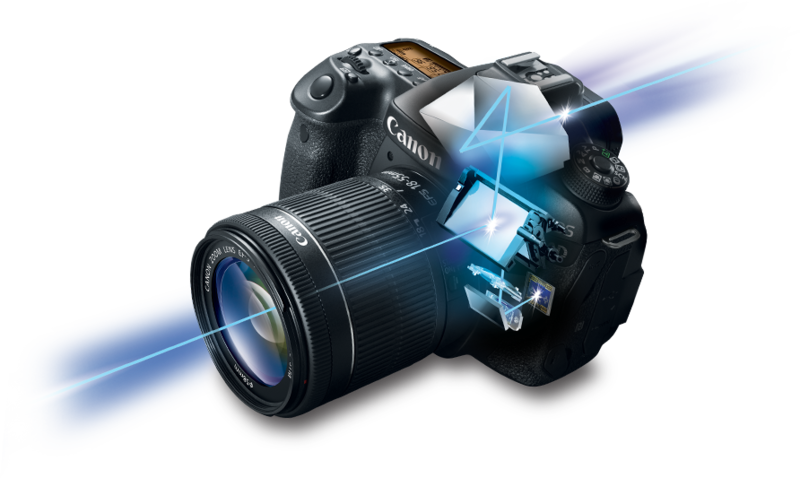 Designed exclusively for EOS M series cameras, Canon’s high-performance electronic viewfinders let you verify framing, magnify an image to check focus and quickly review a photo. 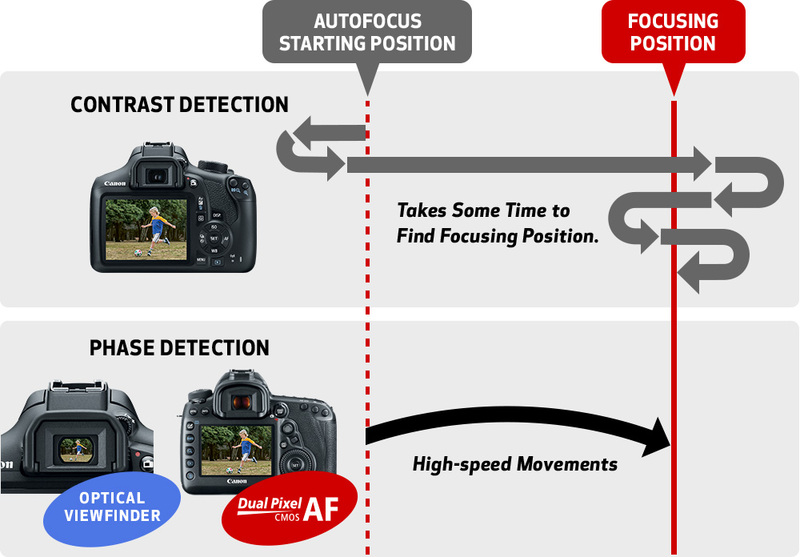 Autofocus in an EOS DSLR is a multi-step process that happens in real-time. 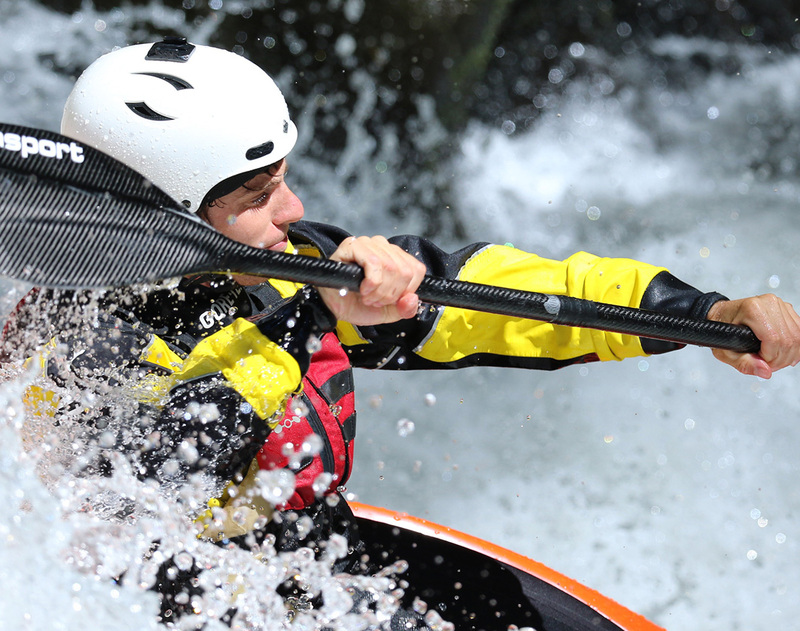 Accuracy and speed are vital. 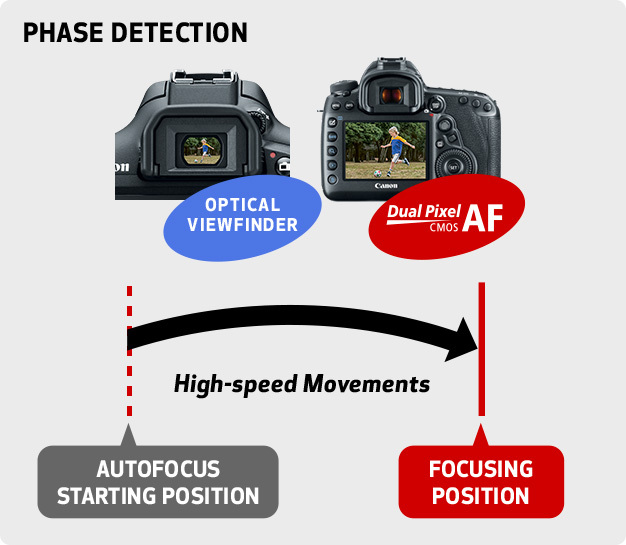 Canon DSLRs use either phase detection, contrast detection or both to determine how far away a subject is from the camera, before focusing the lens on that point. 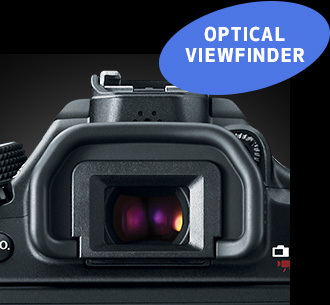 Phase detection is used in optical viewfinder shooting as well as when shooting with Dual Pixel CMOS AF in Live View. 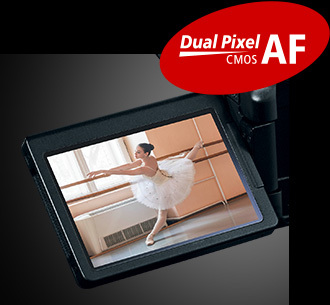 Contrast detection is used when shooting in Live View mode on cameras with other AF systems such as Hybrid CMOS AF III. 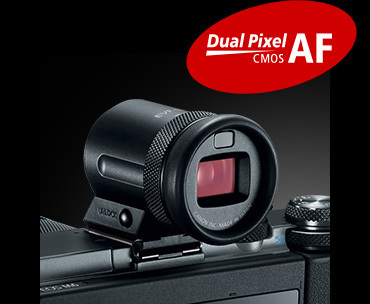 Canon’s AF technology includes both optical viewfinder AF shooting, as well as Dual Pixel CMOS AF for Live View shooting. 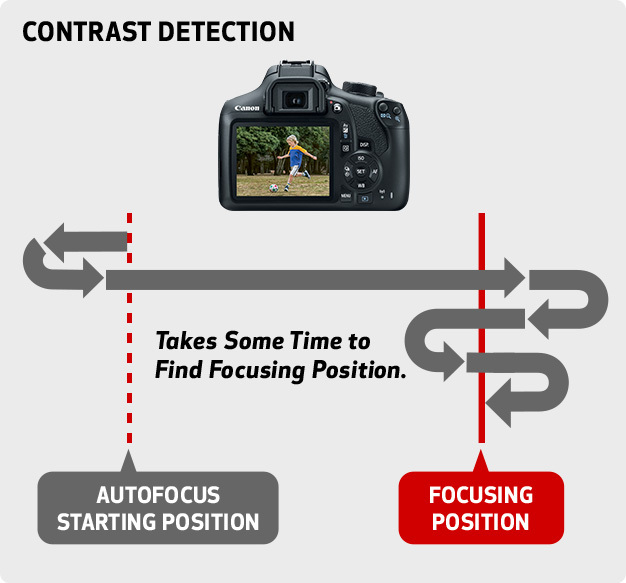 Click the numbers to learn how autofocus works. All light in front of the camera enters the lens. The multiple lens elements concentrate the light onto the reflex mirror (the “R” in DSLR). Some of this light is directed to a dedicated AF sensor (4), which provides phase detection AF with stationary and moving subjects. The reflex mirror splits the total amount of light, sending most of it up through a prism and to the viewfinder. The rest passes through to another mirror. The light not sent to the viewfinder bounces off the sub-mirror and down to the autofocus module. While you’re looking through the viewfinder the AF sensor is ready to determine where to focus. 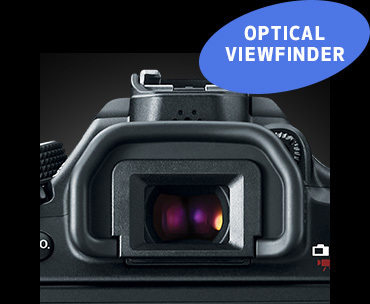 After bouncing off the reflex mirror and passing through prism, the image you see in the viewfinder is essentially exactly what the lens sees. Contrast detection is used by most compact cameras. It determines the point where the contrast is greatest between the edges of objects, calculating focus based off them and adjusting the lens until focus is achieved for a sharp image. Though potentially more accurate, contrast detection may take slightly longer than phase detection. Phase detection is used mostly in SLR viewfinder shooting. It analyzes the difference between slightly different wavelengths of light, instantly determining both the direction to move the lens and how far its optics need to move for the sharpest focus. 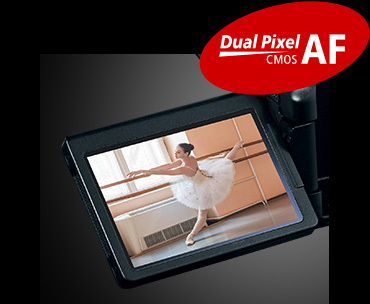 Canon’s Dual Pixel CMOS AF uses phase detection in Live View shooting for high-quality, fast focusing. Not all products have all features.